Something I Can Definitely Get On Board With! 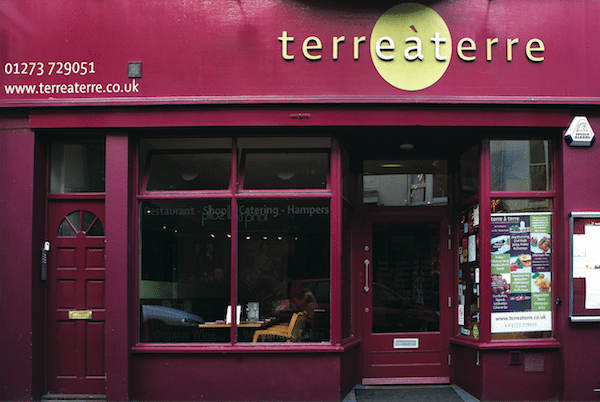 Terre a Terre first came onto my radar around six years ago when I was searching for a vegetarian restaurant to take my sister to. Since then it’s become a firm favourite of mine and I’ve often popped in for their sharing tapas plate whenever I can. Recently there’s been a couple of new menus added to their offering, including the Brunchy Lunch menu which is served between 10am and 1pm daily. When they invited me to come in and try it I decided to invite my friend who is vegetarian so we could evaluate it from both perspectives – due to my meat-eating tendencies ;-). Situated in East Street, Terre Terre is in the perfect location – right next to the seafront and shopping areas of the city. Upon arrival I was surprised at how busy it was for noon on a Friday. 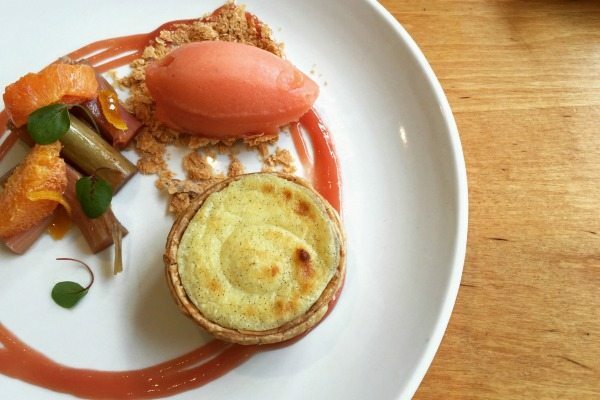 Many restaurants have told us that their lunchtime period is notoriously hard to get bums on seats due to the amount of competition in the area, but Terre Terre seem to have it covered – perhaps this is due to the new menu in place? When we arrived we were greeted warmly by our waitress and sat in the window, which provided the perfect people-watching opportunity! Perusing the menu I could see that this was no ordinary brunch. The beauty of Terre a Terre is that they are constantly pushing the boundaries of meat-free cooking, adapting recipes to inspire and delight their diners. 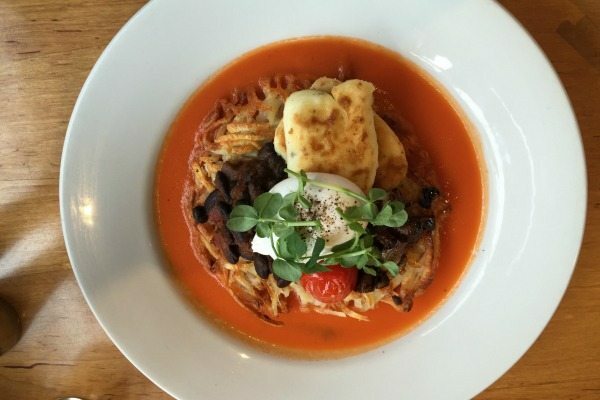 In a city saturated with brunch spots Terre a Terre is at the forefront of the vegetarian brigade. In terms of drinks we were unsure whether to have an early lunchtime glass of wine or go for one of the many organic loose teas on offer. Feeling that brunch and wine didn’t quite feel right I went for a Assam tea and my friend an Earl Grey. Tea is a tricky business and I’m please to report that ours was brewed perfectly and was the perfect accompaniment to our breakfast. The menu is split into four sections, light-ish bites, Big Muffin Butty Buns, Rosti and Sweet Brunch. We decided to try one dish from each section and started with the gluten free ‘Run Rarebit Run Rarebit Pickle Chips’ (£8.50). 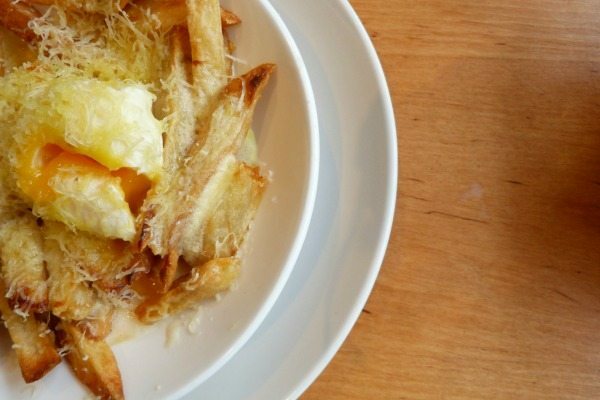 I wasn’t quite sure what to expect, but the menu described them as ‘pickle chips loaded with toasted mustard seed, porter, grilled cheddar rarebit topped with a soft poached egg’. If I’m honest it did feel a little strange to be eating chips for brunch but I would definitely recommend it if you had a little too much to drink the night before as it is the ultimate comfort food dish! Next up was the Peeking Buns (£9.75). These can be served stuffed with szechuan marinated halloumi, or truffle egg omelette with kimchi chinese cabbage, lapsang souchong pickled watermelon & cucumber, a miso chilli sauce and spring onion garnish. The vegan option was Szechuan smoked tofu which sounded interesting so we went for this. 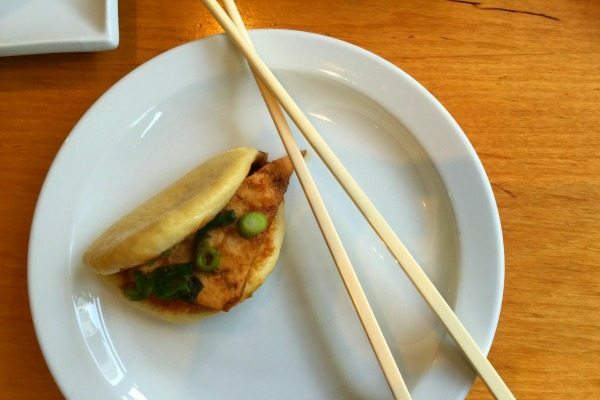 Served in traditional palm woven baskets, the steamed rice buns were light and fluffy, with a generous hunk of tofu nestled inside. The accompanying sauces and pickles went beautifully and added a burst of flavour with every bite. Alongside the buns came the Big Brunchy Lunchy Rosti (£14.98). 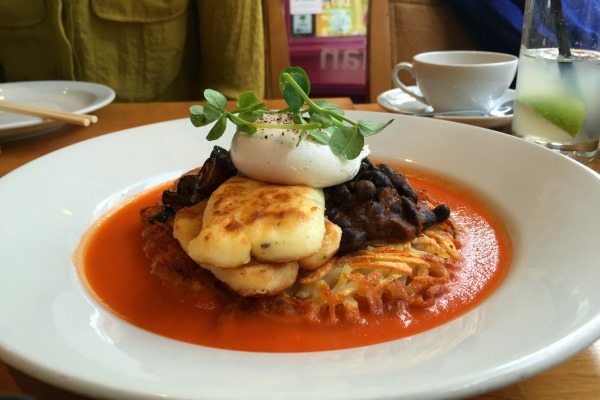 This I was excited about, it seemed the perfect brunch – crispy fried onion and garlic potato rosti topped griddled marinated halloumi and smoked tomatoes, a soft poached egg, chunky tamari mushrooms and vodka baby tomatoes finished with a bloody mary ketchup sauce. At nearly fifteen pounds it is at the higher end of the brunch menu options but oh my it was worth it. The rosti was crisp and full of flavour, the egg perfectly runny and the halloumi chunky and charred on the grill. This was by far my favourite dish, it had all the elements I love in a brunch but with plenty of flavoursome twists. Almost all of the menu items had a vegan option with all cream and butter elements replaced with coconut, nut or plant based butters and cheese replaced with marinated charred Cherrywood smoked tofu. Gluten free options and potential allergens are clearly marked and I feel that the management had put a lot of time into making ordering as simple as possible, I have a friend who is seriously allergic to egg and I would be confident to recommend he eat here. By this point we were pretty full, but when we were offered to try the Pastel de Nata (£5.50), a delicious crispy and creamy Portuguese warm custard tart, dusted with mace and served with a fresh sorbet. 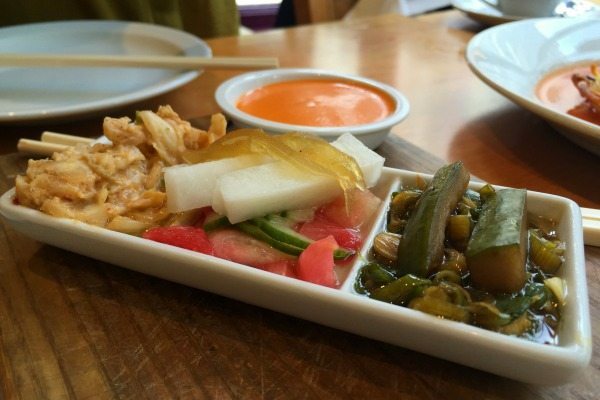 What a treat for the eyes – not to mention the tastebuds! The pastry was buttery and flaky and the custard filling warm and decadent. Not your average brunch option but perfect for those with a sweet tooth alongside a cuppa. 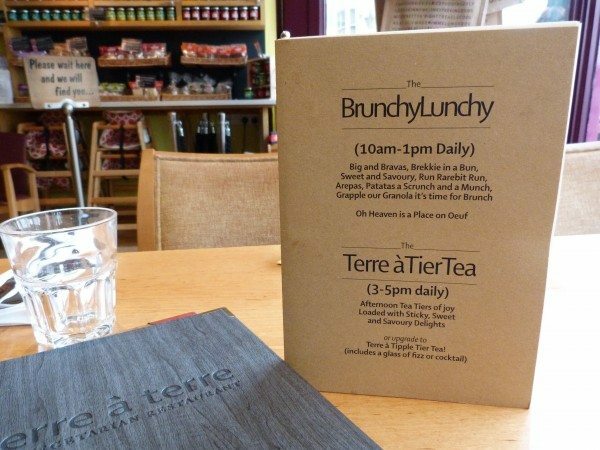 Top marks to Terre a Terre for breaking the brunch rules and going for something innovative and different. I’m not sure my waistline would fare well from eating chips as a meal regularly but there’s plenty of healthier options to choose from if you so desire. My advice; Start with the rosti and then treat yourself to the Portuguese tart. Dessert for brunch? Now that’s something I can get on board with.